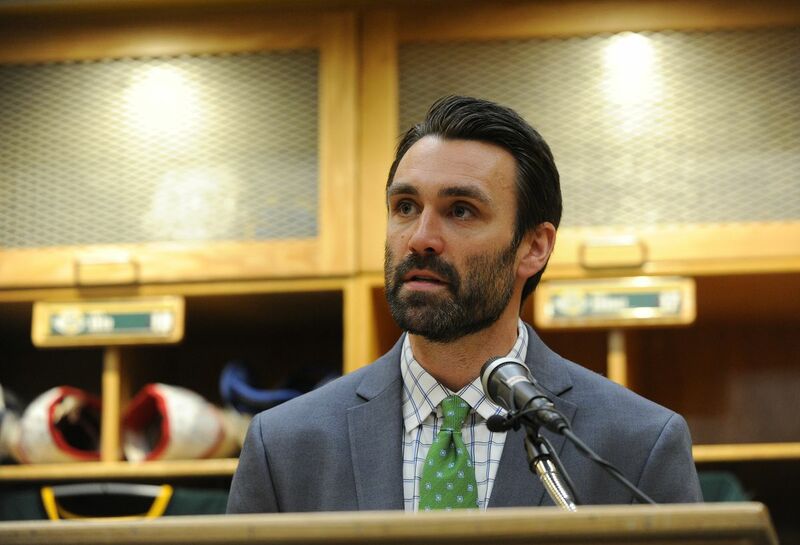 Matt Curley is practicing patience as he settles into his new job as UAA's hockey coach. He found a place to live in Anchorage and is busy at the school greeting veteran players who are returning to school and newcomers who are arriving on campus for the first time. — The hiring of a new assistant coach to replace one of the men who Curley brought on board shortly after becoming the Seawolves' bench boss. — An NCAA decision on the eligibility of Anchorage forward Alec Butcher, who was one of the team's top scorers after joining the team as a senior transfer halfway through last season. Curley is in the market for an assistant coach because Dana Borges, one of two assistant coaches Curley hired this summer, decided to take a job elsewhere. Curley didn't say where Borges is going "out of respect to his new employer," which hasn't yet announced the hiring of Borges. Last season Borges was an assistant coach at Williams College in Massachusetts. UAA begins practice in less than two weeks, and while it would be nice to have a full coaching staff by then, Curley said he'd rather make a good hire than a swift one. "I don't want to make it a quick hire just for the sake of getting someone in," he said. "We want the right person for right position. Until then we're hunkering down (and) filling in holes where they need to be filled." Curley said "a number of qualified candidates and people have reached out and shown their interest" in joining the staff. "I'm excited about the prospects and hopefully getting that done sooner than later," he said. As for Butcher, UAA is still awaiting to hear if the NCAA will grant him another season of eligibility. Butcher has played 2.5 seasons of college hockey. He played two seasons at Sacred Heart University of Connecticut and then sat out 1.5 seasons after transferring to UAA. He sat out the entire 2016-17 season and didn't become eligible to play for the Seawolves until the second half of last season. In 16 games last season, Butcher scored eight goals and five assists, numbers that ranked him second on the team in goals and fifth in points. "Alec is still on the fence," Curley said. "We're just working through the process and hopefully we'll get an answer here soon (and) hopefully we'll have a good decision and move forward with it." UAA opens the season Sept. 28 with an exhibition game against Simon Fraser University at the McDonald Center in Eagle River. Curley said the Seawolves are a mix of players back from last season's 4-28-4 team, recruits signed by former coach Matt Thomas and players Curley recruited after being hired to replace Thomas. "It's kind of a hodgepodge class," he said, "but one we're happy with."